Volvo is the other come back kid from Europe, much as Ford has done over here in the US. The carmaker, once thought of as dead has come back nicely with a well diversified portfolio of cars, including a plug-in hybrid that will be presented at the Detroit Auto Show. Volvo XC60 Plug-in Hybrid Concept. The Volvo XC60 Plug-in Hybrid Concept offers a smart choice between gasoline and/or electric power whenever the driver needs it. It will be officially unveiled at the Detroit Motor Show in January 2012. In its electric car mode, it becomes an economical hybrid and powerful car, perfect for city driving. At the touch of a button, the driver can chose between the available power modes, from a combination of the gasoline engine and the electric motor to one or the other. Sporting the company’s 4 cylinder engine from the new VEA engine family, the new engine will be available in a couple of years. Volvo C30 Electric. Speaking of the company’s first electric car, the C30 electric, Volvo delivered 15 of them to the City of Shanghai for further open road test-drives in 2013. The C30 Electric was awarded "Green Car of the Year" in China already at the 4th China New Energy Mobility Summit. Volvo V60 Plug-in Hybrid. There’s much to like about the V60 PHEV. 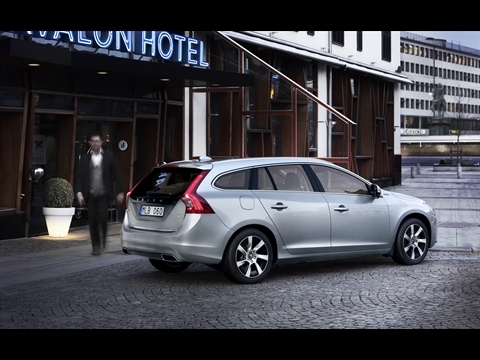 The V60 Plug-in Hybrid is the answer to a question we commonly ask ourselves, why not a diesel plugin hybrid? The V60 PHEV is so far the world's first diesel plug-in hybrid, giving owners an electric range of 31 miles and fuel consumption as low as 130 mpg with a 48 g/km CO2 in hybrid mode. It can be driven in pure electric car mode or become a high-efficiency hybrid with a 0 to 60 in about 6.1 seconds. The car already has reached its first customers late 2012, the first out of the 1,000 ‘Pure Limited' series that was sold out before reaching the showrooms. Production will increase to 4,000-6,000 for 2014. Fast Charging A La Volvo. Everyone wants to charge quickly and Volvo has been listening. The company claims to cut your recharge time experience down to 1.5 hours. Volvo has been testing a new 22 kW fast-charger for its electric cars that brings down recharging time to a about 1.5 hours. Compared to today’s standards, that is six times faster than today's on-board chargers. Volvo wanted to make sure it wouldn’t be hindered by the co-called “range anxiety” phobia with a car that can be quickly recharged throughout the day. The new charger is currently being evaluated on its C30 Electric cars. Volvo’s Strategic Partnerships. Yet all of this cannot happen without clever strategic partnerships where Volvo revealed it had partnered with electronic equipment supplier Mitsubishi Electric Corporation for its next-generation infotainment system for its future cars. Mitsubishi's will deliver the infotainment system on future Volvo cars. Volvo also joined forces with neighborhood Ericsson to further its cloud-based features and systems. Both companies signed a Memorandum of Understanding with the members of the CAR 2 CAR Communication Consortium regarding implementation of shared technology for communication between cars in 2016. Finally Volvo strengthened its partnership with Siemens and will continue to development its electrification technologies. Volvo has come up quickly since it was sold by Ford with an impressive array of cars that should meet almost anyone’s needs. It will be interesting to see how Volvo’s diesel plug-in hybrid does in the US where traditionally that fuel has been shunned due to its past decade image. Wait, hold the phone... when is the V60 Plug-In Hybrid coming to the US?!?! If all it took were customers clamoring for a vehicle we would already have the EV1, the Rav 4, the electric ranger, the Jeep Gladiator, and i'm sure a bunch more. Just customer enthusiasm/acceptance is not enough. The v60 volvo may make it here, but when? and at what price? I've been watching Via motors EREVs since before it's formation. It started life as a Razor vehicle concept of which they buildt two. But you still would have a hard time getting your hands on one even if it wasn't priced in the stratosphere. Bringing a new concept to market is no easy task. Just ask Tesla motors. The Volvo V60 turbo diesel plugin hybrid cost a minimum of $70,000US in the UK when it was offered. It sold out relatively soon after that. I have been in contact with Volvo for several years, but they have not committed to sending the diesel version to the US (only gasoline, which will not be nearly as efficient). Here are my contacts, if you wish to add to my efforts to "encourage" Volvo to respond to customer desires: Erica Kirsch replying for Jim Maloney [email protected] [email protected] Good luck. Maybe we can make a difference. I was completely taken back when Volvo announced the pricing for this vehicle. I think one would be able to buy a couple other plug-ins for that. Nice car, to rich for the average consumer. That's always going to be a big problem with first time offerings, expensive. But knowing the Volvo clientele, they will find a few takers. At least, let's hope for it. Another ex-Ford For You: the Volvo XC40 Electric. Competes with Jaguar, Audi, and Model X, with Model 3 Price Point! With Polestar 2 the “Model 3 Killer” it Begs to Ask What Kind of Brand is Polestar and Can’t this Just be a Volvo? Amazon Begins In-Vehicle Delivery Service - Is Your Car Compatible?